How do you prepare for Pentecost? As followers of Christ, we are invited to become Easter people filled with the Holy Spirit. The Resurrection is the center of the Christian faith. Without it there would be no Christian story, Christian church, or Christian way of life. Did you know that the Christian calendar sets aside a season of 50 days between Easter and Pentecost? The Easter season, sometimes called Eastertide, includes our Lord's ascension and leads to the Day of Pentecost, when Christians remember the outpouring of the Holy Spirit on Jesus' first followers. Have you ever taken 50 days to deliberately walk the path from Easter to Pentecost? Trevor Hudson writes, "If we are willing to take the time to pause, the season of Eastertide can become a time punctuated with precious moments of encounter with our risen Lord." 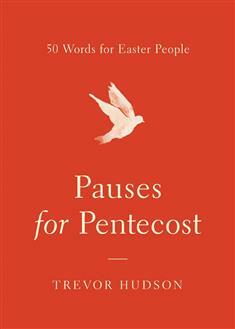 Pauses for Pentecost offers 50 brief meditations that guide you to reflect on a biblical word and scripture passage, then do a simple daily practice. The daily practices do not take much time, and they are designed to let the new life of the Resurrection and the power of Pentecost flow into your life. Discover how to open your heart and mind more fully to the joy of Christ, the presence of God, and the power of the Holy Spirit.